*(… —follows on from *‘the image.—vs. Platonic ressentiment’, *‘—toward a disruptive, anti-transcendental “classicism”’, and *‘—the “classical”.—vs. the “romantic” (in Joyce, Nietzsche, and Hulme. )’ …). —I’ve struggled to (re-)write the material on the ‘classical’—working from notes, fresh readings-materials, and fragments—in a way that I hadn’t foreseen (after all,… the parallels between the opposition of the ‘classical’ to the ‘romantic’ in Joyce, Nietzsche, and Hulme are fairly obvious and straightforward, and I had the mass of the material ready prepared from the fragments of my doctoral thesis). And that is what I hope to present here. (I’m still anxious that all of this is too… superficial. … —too precious and too loaded). I’m aware that there is a fair amount of assumed knowledge—of Pound, Imagism, and the Imagists, without a great of background: historical, biographical (etc. 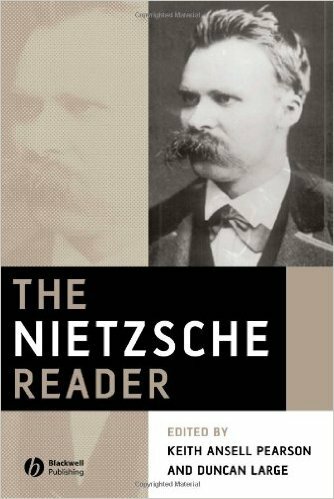 )—in my reader (as there was in my argument on Nietzsche and Birth). As such, I focus on a small number of (what seem to me to be) their key collective claims, eschewing wider discussion of the key figures involved in Imagism (and their wider literary output), and—to be honest—I do no real justice to ol’ Ezra (really), focussing on the key terms in the development of his writing on Imagism and the ‘image’, and not discussing his life or wider work. *—I’m aware that a lot of the posts I’ve put up here are, really, far too long for the patience of most readers. *In order, in the end,—to… —draw out (then), in effect, the deep-rooted connection between the ‘classical’ and the ‘image’. *—The concept of the ‘image’ lies at the very heart (of the evolution-development) of Ezra Pound’s critical writing, as well as (—clearly) the (self-styled) Imagists shared project. *(For a crude, brief, and largely incompetent history of ‘Imagism’, the reader is pointed toward the last portion of my ‘the “image”.—vs. Platonic ressentiment’. —For a more lucid, detailed, and developed history, the interested reader is recommended to consult Peter Jones’s excellent ‘Introduction’ to Imagist Poetry. …). *—. I want to pause here (as a sort of an—aside, I s’pose) to dwell on the work of Pound and the Imagists. In particular, I want to examine, and to draw out the stakes of, the close (nay—the intimate (let’s say it)) relationship between the concept of the ‘image’ and that of the ‘classical’. *(—what a ‘classical’ art-poetry might indeed look like. … ). —I’ll read from Pound’s critical writing and the Imagist’s manifestoes in order to draw out their key artistic claims (or demands), as well as the philosophical (so to) characteristics of the ‘image’, before moving on to read some examples of Imagist poetry, in order to analyse the artistic practise and poems (poetry) to which these claims and characteristics gave rise. *—the intimate connection between the ‘classical’ and (the concept of) the ‘image’, and the impact of this development on literary-poetical theory and practise. *Whilst, as I said in my ‘brief history’(sic) of Imagism, it’s problematic at best to try to regard Joyce himself as, in any way, a practising ‘Imagist’,… examining the ‘image’ (or, rather: images) of Pound and of the Imagists, will help me to clarify what I believe is at stake in Dedalus’s theory of the ‘image’ in Portrait (and its development from the ‘epiphany’ of the Stephen Hero draft),—helping me to demonstrate its (intrinsic) alignment or parallel (for want) with the overall development of Nietzsche’s theory of, and writing on, art and the relevance of an understanding of Nietzsche, his theory of art, and relationship to Romanticism, to an understanding of the intellectual (—philosophical and artistic) underpinnings of (self-styled. ‘neo-classical’) Modernism. In particular here, I want to focus, quite liberally and freely actually, on Pound’s ‘A Retrospect’ (incorporating ‘A Few Don’ts by an Imagiste’, first printed in Poetry, March 1913, and reproduced in ‘A Retrospect’: Pound, Pavannes and Divisions, 93-111)) as well as the prefaces to the 1915 and 1916 ‘Imagist’ anthologies. *(—The two prefaces are reproduced in Jones, ed., Imagist Poetry, 134-140). 1. To use the language of common speech, but to employ always the exact word, not the nearly-exact, nor the merely decorative word. 2. To create new rhythms—as the expression of new moods—and not to copy old rhythms, which merely echo old moods. We do not just insist upon “free-verse” as the only method of writing poetry. We fight for it as a principle of liberty. We believe that the individuality of a poet may often be better expressed in free-verse than in conventional forms. In poetry, a new cadence means a new idea. 3. To allow absolute freedom in the choice of subject. It is not good art to write badly about aeroplanes and automobiles; nor is it necessarily bad art to write well about the past. We believe passionately in the artistic value of modern life, but we wish to point out that there is nothing so uninspiring nor so old-fashioned as an aeroplane of the year 1911. 4. To present an image (hence the name: “Imagist”). We are not a school of painters, but we believe that poetry should render particulars exactly and not deal in vague generalities, however magnificent and sonorous. It is for this reason that we oppose the cosmic poet, who seems to shirk the real difficulties of his art. 5. To produce poetry that is hard and clear, never blurred nor indefinite. 6. Finally, most of us believe that concentration is of the very essence of poetry. 1. Direct treatment of the “thing,” whether subjective or objective. 2. To use absolutely no word that did not contribute to the presentation. 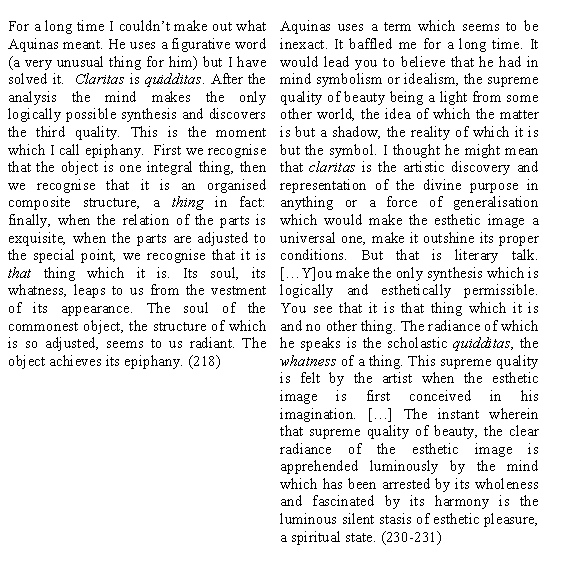 *… —an absolute (in the sense of uncompromising), sharp, hard (that is,—ruthless) poetic-literary *economy (—‘concentration),—& (an equally absolute) fidelity to the (artist’s) model, & to the impression (so to.—the experience, I s’ppose, of artistic inspiration). And this is what is meant, I’d argue (at least), by the Imagist’s appeal to: ‘a principle of liberty’: ‘a new cadence means a new idea’. *…—attention. being brought into focus upon the ‘thing’ in question (—the ‘thing’ itself exciting-eliciting this attention, and thereby becoming the artist’s model … ), which serves to bring into question (to—undo?) the dismissive complacency (—of habit, apparent familiarity,—of (quotidian) prejudice) with which it would, otherwise, have been greeted. *(—compare on this: ‘A Few Don’ts’… —on ‘sincerity’, and a ‘certain limpidity and precision’ as ‘the ultimate qualities of style’. 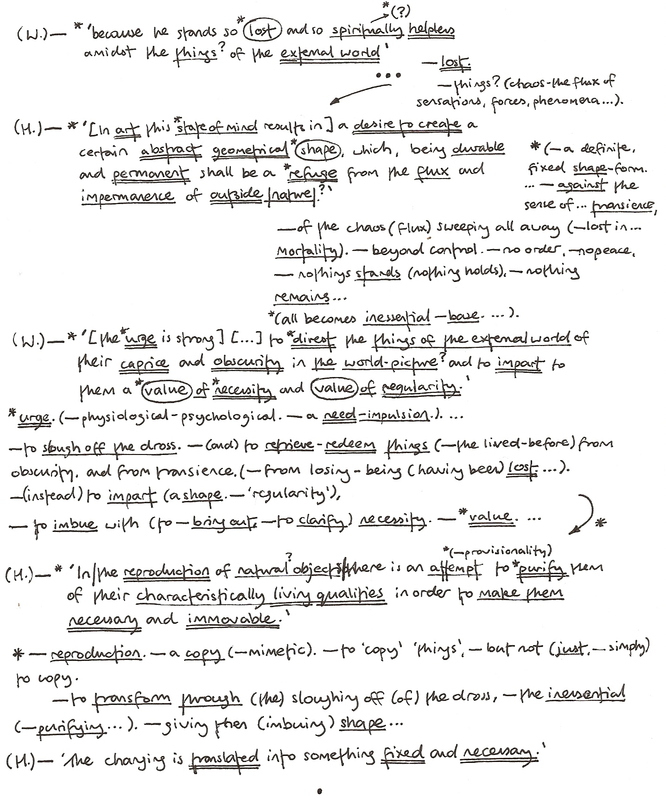 … *[103: on ‘Technique’, and 132] … ). We say that the world’s magnificence has been enriched by a new beauty; the beauty of speed. A racing car whose hood is adorned with great pipes, like serpents of explosive breath—a roaring car that seems to ride on grapeshot—is more beautiful than the Victory of Samothrace. *—In ‘Vorticism’, Pound dismissed Futurism as mere ‘accelerated impressionism,’ dubbing it ‘a spreading or surface art.’ (279.—See also, Jones, ed., Imagist Poetry, 21). *—With what can be characterised as its combination of Impressionist (—particularly the plein air movement’s self-avowed goal of capturing the vitality and flux of the lived-experience *(—the artist’s subject-model) and Cubist (—Picasso’s form of psychological realism) influences, … —Futurism marks, or rather names, the artistic attempt to capture and to articulate the changes in the perception and velocity of daily life opened up with-in the advent of new technologies (—particularly of the aeroplane and automobile… ). —The Imagists, then, sought (explicitly and conscientiously) to place their emphasis on (what here could be called) the *stasis, … *—the concision (—exactness), and clarity of images and, thus, the very concept of the ‘image’ (itself), in stark contrast-opposition to Futurism’s (Marinetti’s) emphasis upon technology, velocity, and also (by extension, I’d argue) its violent reactionary politics, which glorified militarism and nationalism, and offered a violent rejection of feminism: ‘We will glorify war—the world’s only hygiene—militarism, patriotism, the destructive gesture of freedom-bringers, beautiful ideas worth dying for, and scorn for woman’ [ibid.]. …). In the stead of the ‘Platonic’ otherworld of the ‘cosmic’ symbolist poet, and the brash high-velocity machismo of the Futurist artist, then,… —the Imagists lay an emphasis, echoing the terms of the ‘classical’, as I have laid these out, in Joyce, Nietzsche, and Hulme, on an unflinching, anchored (pragmatic) concern with (fidelity to) lived-experience,… —what could be summarised here, for my current purposes as the experiential stoicism and philosophical scepticism of the ‘classical’,—as evinced by ol’ Jimmy J.., Fritz, and Hulme.